Up bright and early this morning, Londonist went to Charing Cross tube station to test out the six month wi-fi trial that was launched today by TfL and BT Openzone. The service is supposed to cover the ticket hall and platform levels, but not the trains themselves, and our experience pretty much mirrored that promise: we got a full three-bar signal on the Northern and Bakerloo line platforms, and at other points around the station. Even on a Bakerloo line train our device was still connected, although the signal disappeared once the train passed into the tunnel. Pleasingly, and in contrast to the experience many have using the BTOpenzone service above-ground, our iPhone 3GS on O2 connected instantly, and we were soon browsing the web; other mobile users with free wi-fi minutes should also be able to access the service without charge. The connection is a fast one, meaning that checking email or catching up on the news is easy if you're on the platform with a few minutes spare waiting for a train. For more web action on the Underground, check out Annie Mole's list of mobile phone hotspots on the Tube. 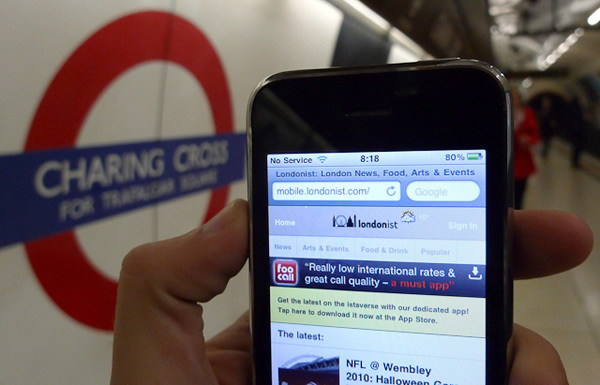 And if you're a regular roaming wireless user, it'd be remiss not to have our iPhone app of free wi-fi in London.